I’m not even sure where to begin. I guess with a funny story or two. Anyone that went to Gambino’s during its earlier years/my childhood remembers the corner round booth. My family is a Catholic family, so we always sat in that booth when we could get it. And trust me, Saturday nights after church, you were lucky to get that prime spot! Anyway, if we had to go to the bathroom, as typical kids, we’d crawl under the table. Yes, you know where this is going. I knocked over the table and knocked all of the pop into the pizza. Sad face. My parents were not pleased. It really was an accident. After that, I quietly cursed the booth, and it’s no longer there. Part of me always wonders if it was because of too many table-related casualties. But I digress. Gambino’s has a big menu selection, a salad bar that looks limited, but has all fresh ingredients (or at least it used to, I don’t have insider information like I used to), including homemade ranch, dough they make fresh every day, the best taco pizza, EVER, sandwiches, pasta, soup. It seems like every year their menu expands a little more. Part of me thinks they do it based on what their employees (mostly high school and college kids) suggest. Probably on a hangover. But I support this. 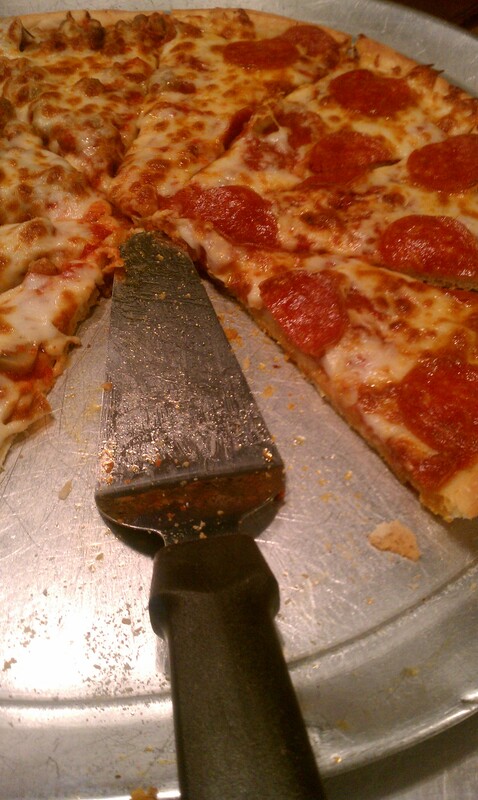 And there’s nothing like a little Gambino’s after a night of beer drinkin’. OK, so where do I even begin? With some of my favorites? Some of other people’s favorites? By posting some pictures and heading to Colwich for pizza? I choose option #3. I think I’ll start with some of my favorites, and hit some of my family’s favorites, too. My all-time favorite which is a menu item with some “Kristy-ing” is their Italian Chicken and Tomato pizza, plus jalapenos. This pizza has olive oil and seasonings for the sauce. Grilled chicken and tomatoes, then add the jalapenos for spice. This is my go-to pizza. I probably get it most often because of all of the stuff I get, this is the newest menu item (by new, I mean I think they created it when I was in college). I love it! Overall, I also love their taco pizza. I’ve never had a restaurant come close to the deliciousness you find on the taco pizza. They use a taco sauce for the pizza sauce and cook it with beef and cheese (and onions?). Then when it comes out of the oven the load it up with lettuce, cheese and tomatoes. Then sides of the taco sauce. 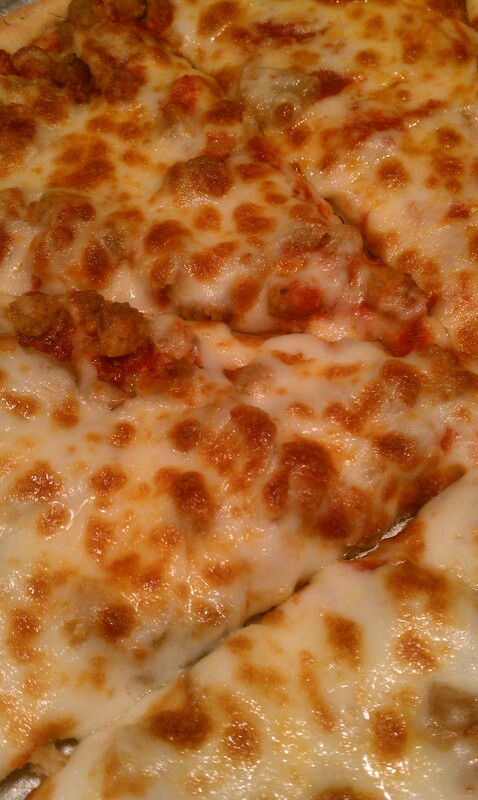 I’m telling you, my friends, this pizza is perfection. I also love their deluxe pizza, which is similar to Pizza Hut’s supreme. Here’s a funny story. When I worked at Pizza Hut people with Colwich numbers would call and order a “deluxe” pizza or ask, “What do you call a deluxe again?” And when I worked at Gambino’s people would order supreme or ask what Gambino’s called supreme. The people at Pizza Hut always asked, “Why do they call it deluxe?” Welcome to Colwich, America, people! Haha! Their cheese sticks and garlic sticks are a thing of beauty. And probably actually rank higher on the ordering scale than the deluxe pizza. The garlic sticks are a lighter version of the cheese sticks, and come with garlic on them. The cheese sticks are a glorious, cheesy, delicious concoction. Cooked to perfection. Both are dipped in bread stick sauce. Order based on your cheesiness. My sisters also introduced me to putting one topping on the cheese sticks, which is also wonderful. And if you’re going all-out Gambino’s, dip them in the homemade ranch. Life is good. The have a mobster, which is similar to Pizza Hut’s super supreme, but it’s too much topping-wise for me (whether it’s from Pizza Hut, Gambino’s or anywhere else). And they have a German pizza, which I know has sauerkraut, but I can’t remember which meat. When I order pizza with my parents I say, “Anything but German.” Ew. I hate sauerkraut. But they love the stuff. My aunt’s a huge fan. My parents also like to get the vegetarian pizza, which I can never remember if it comes with tomatoes or not, but I always request to have them added. And they have the typical Hawaiian and Meat Cravers (is that what it’s called? I rarely order all-meat pizza), too. 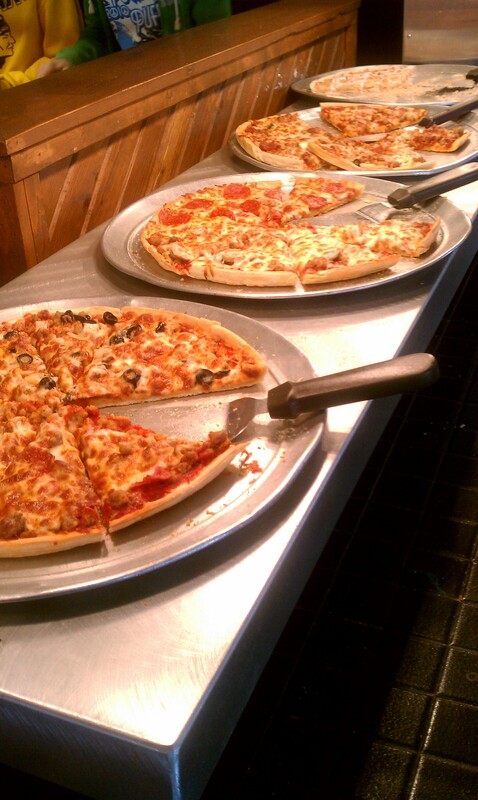 And of course you can build your own (my favorites are either pepperoni and black olive or pepperoni and sausage). I’ll throw another Kristy-special out there if you STILL can’t think of a pizza you’d like: Vegetarian plus Italian sausage. I hear it’s amazing. I’m not an Italian sausage girl. That’s what she said. And then we’ve moved onto pasta and sandwiches. Back in the good old days when I’d hang out a Gambino’s on a Sunday when my sisters were working, eat lunch, and do homework, I’d occasionally get a Turkey sandwich with both dressings (which means mayo and Italian). I also like their pepperoni sandwich. Sandwiches come with either mayonnaise or Italian standard, but they’ll switch it up, of course. I also had my days where I’d crave the spaghetti which runs through the oven with a very generous portion of cheese on it. And they also have soups, and used to and still might have chicken strips and fries (all three of which I don’t think I’ve ever ordered, so I can’t give a review on). Beer on tap. What else could you want? Oh! Dessert pizza! They have plain, cherry and apple streussel pizza. I’m not a huge dessert fan, but I would definitely rank it above Pizza Hut’s. I know I’m missing a ton of stuff. But I promise if you go to Gambino’s, you won’t be disappointed. Locally owned, and still run by the owners. You’ll especially see them in there on Friday nights so their employees can go to football and basketball games, or on and around holidays to give their employees time off. And, if you’ve been but haven’t been in awhile, when I was in there a few weeks ago, they were working on renovating. Again. So put it back on your list! And if you don’t want to eat in, they have a drive-thru! I hate to admit my pictures are limited because I always forget to take pictures before I dig in. I’ll take more each time I eat pizza, and keep adding them. Salute! I forgot to mention they have buffet. I know it’s available during lunch Monday-Saturday. I can’t remember if they also have it on Sundays. Mmmmm… Where’s my salad? Let’s eat! Yum! Also the perfect place to work and meet your future (cop) husband! =) Oh, and if I may say so.. I think if anyone were to give Gambino’s a review I don’t think they could have done it half as good as you did! You have to truly love everything about Gambino’s (like we do) to truly appreciate it’s greatness! You missed the Christine special, Turkey sandwich (minus the dressing, lettuce, and tomatoes) plus italian sausage and extra cheese, cooked in the oven to gooey perfection (I think she dipped this in ranch, but I know it’s good either way… And I think I’ve seen Kevin dip it in spag sauce (good this way too)).. I might also add, I don’t think there is a single thing on the menu I haven’t tried (with the exception of their newer additions), but I guess that’s what happens when you work there for five years! You guys knew how to really make something yummy, though. That’s what a love of food will do! Now I think they think I’m crazy if I ask for something random. Of course, not eating there two or three times a week means I want less variety. Oh how I love Gambino’s. Mmmmmm! Thanks, Maria! Yes, please feel free to put this on your site. If you copy and paste, would you mind linking back to this site? Either the site in general, or the post for Gambino’s specifically.